Blue Lines is unlucky. It couldn’t rely on the huge influence it had for lasting critical acclaim. Everyone talks about how outdated this is and they’re right. Pretty much any work of Trip-Hop that came after this pushes the genre way more forward. You don’t have to look too far. Just listen to some Tricky, Portishead and UNKLE and you’ll find artists with a wider vision, a more diverse palette of influence and more conceptual depth. Their concepts are also so different that they hold Blue Lines back from being outdated. Trip-Hop has a lot in common with other 90’s genres such as Gangsta Rap, Nu-Metal and Industrial Rock. It’s full of darkness, sexuality and general pessimism. The approach may be more artistic, but the negative moods remain the same. Blue Lines is the opposite. Instead of drawing abandoned and heartless landscapes, it’s enjoying life. In truth, you shouldn’t compare it to other works in the genre. Even the influence have different filters. Massive draw from the smoother side of Hip-Hop and from the pleasant, easy side of Soul. ‘Easy Listening’ describes best the album. The breaks are slow, but funky and still hard. The rapping is so laid-back there are no rhymes to follow. Barring the oddly aggressive “Safe From Harm”, the singers sing about the virtues of love and being thankful. Many artists have tried to make an album like Blue Lines. A lot of rappers made this type of ‘smooth rap’, but no one does it like Massive Attack. Unlike rappers who focus primarily on impressing you with rhymes (that are boring anyway), Massive Attack put more emphasis on mood. “Blue Lines” is better than anything by A Tribe Called Quest because of how precise it is in getting the atmosphere right. The break is rolling with a perfect balance between banging and not being too loud. The hushed rapping fits with the vibes. They’re not out to impress you. They’re chilling with you to the beat. Maybe what people mean when they say the album is ‘outdated’ is because of how unambitious it is. The unassuming title-track makes it obvious. Unlike later producers who made huge statements with their albums, Massive Attack are trying to create good vibes here. Nothing here sounds revolutionary, like a new sound that inspired a lot of people. “One Love” is just a reggea song with more a Hip-Hop beat. “Unfinished Sympathy” is what happens when a Soul singer meets some Hip-Hop producer. Yet this unassuming, unambitious nature doesn’t ruin the album’s quality. It’s only unambitious because its aim is to create nothing good vibes. The album is perfect when you hang out with a few friends not doing anything big, or when the party is at its end and most people have gone home. The atmosphere is still social and danceable, but slower and content rather than happy. It’s shocking to think this was released so early. This album was available for everyone, and smooth rappers couldn’t imitate it? Blue Lines is an oddity in the Trip-Hop genre. It’s out of place in the canon because of how different then approach is. It may not be as deep as Mezzanine or far-reaching as Psyence Fiction, but there are few albums like it. Sure, there’s a lot of smooth Jazz and smooth Soul and smooth Rap. Massive Attack combines all these for an album that perfects the calm and social atmosphere. Forget about genres. It’s such a pleasant album that I can’t imagine anyone not finding something to like here. There are two ways to view this album, both of which are related. There’s an attempt to follow the blueprint for every good dance album. Artists that follow this blueprint make sure that first and foremost their tracks bang, and then surround them with quirks and amusing ideas to make them memorable. There’s also an attempt at a statement-making album. Knife Party tells us they are beyond the Bass Music scene. Why would they try to go beyond it is a mystery. It’s a scene that spawned LAXX, Skrillex, Excision, MUST DIE! and Barely Alive. Unlike the bland European house that Knife Party borrows from them a bit, Bass Music artists actually understand how dance music works. Either way, this statement is a failure. Knife Party’s version of being ‘experimental’ is merely avoiding Brostep. Many of the ideas they replace the Brostep with are not only less original, but are not worth exploring. “Red Dawn” relies on a Middle Eastern melody, and this one-note idea makes it sound like a DJ tool by some Martin Garrix clone. The melodic “Kaledioscope” is just a less progressive Orbital, and “Begin Again” is Hardwell or Avicii with better vocals. “EDM Trend Machine” doesn’t add anything to the modern Deep House formula. The snippet of Brostep and Big Room before the drop doesn’t change much. It’s barely a second, so it doesn’t leave any effect. This idea was later improved on by Getter’s “Dubstep Is Dead”, who used this structure much more effectively. He also added a Hardstyle drop. Another problem with these songs is that Knife Party operates in an area they don’t feel comfortable with and show little understanding of it. “Going soft” seems radical for an artist as aggressive as Knife Party, but the aggressive tracks sound much more inspired. It makes you wonder if Rob Swire only churned “Kaledioscope” just to say that he can do more than make noise, but why would he avoid making loud noises if this is where he’s most inspired? “404”, “Micropenis” and “Boss Mode” are just as aggressive as anything by Excision, and this time the quirks actually work. There’s a chiptune breakdown in the middle of “Micropenis” that sounds jarring at first, but actually fits in such overblown music. “Boss Mode” is a Drumstep track masquerading as Twerk. “404” is pure mayhem. The melodic build-up is the only thing stable about. Error sounds, glitches and a Big Room drop that takes the genre to its extreme. Even their attempt at Disco in “Superstar” sounds like they added a little funk to “404” instead of borrowing their ideas from Daft Punk. Disco never had such hard drums. Rob SWire’s attempts at originality failed, but it barely harms the quality of Abandon Ship. As a dance album, it’s fantastic. Every single track here is a banger. The aggressive tracks are much stronger than the softer ones, but even the soft ones are good enough to not let the album down. It’s a testament to Knife Party’s talents that “Begin Again” is as a good as it is. Give it to Hardwell or Avicii or Armin Van Something, and you’d get white noise. In the hands of Knife Party, this style of melodic house sounds like it has a future. It’s not just Rob’s vocals. When the drop comes, it’s focused more on an uplifting atmosphere, and it doesn’t rely just on its drop anyway. The drop in “EDM Trend Machine” is being done to death, but there’s still a great bassline there. Only “D.I.M.H.” is bad. It’s a bland, melodic track that is supposed to be ‘traditional’. If it is, I’m glad Leftfield and Underworld destroyed that trash. There’s no way the people behind “Give It Up” made such a shoddy production job. Once you get over the pretense that this album is more original than its peers, it’s a great dance album that gets everything right. Knife Party’s transition to album should’ve come earlier. Abandon Ship actually feels too small. It could definitely use a few more tracks, perhaps an actual drum and bass one or another moombahton. 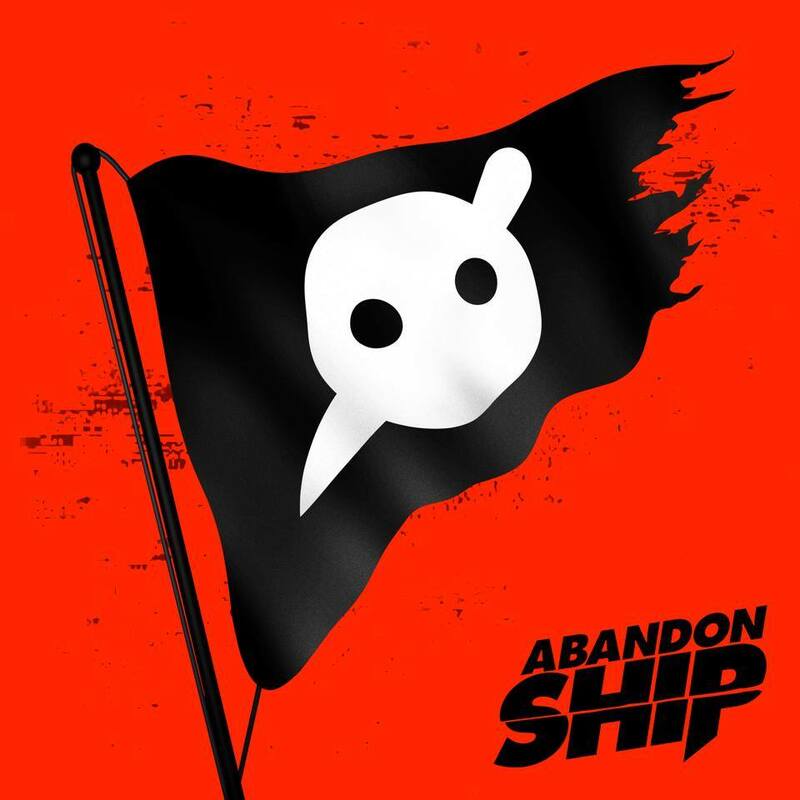 Despite Rob Swire’s attempt, Abandon Ship belongs to the Bass Music section and another example of how exciting and underrated that genre is. Just forget about “D.I.M.H.”.